This blog hop is being hosted by I Am a Reader, Not a Writer and Down the Rabbit Hole. To enter, read the terms and conditions and use the Rafflecopter widget and don't forget to visit the other blogs in the hop here. I really want to know what happens with Lena and who her new love interest. Maybe possibly find some info on what happened with Alex. I am anxious to know how Lena fairs on the other side without Alex and if she still believes in love. Good god, let Alex be alive!!!!!! Seeing what happens to the characters. I just can't wait to see what is going to happen!! Delirium ended so tensely! I cant wait to see what happens! Alex and Lena! I have to know what happens with them. I want to know what happens to Alex and how Lena does on the outside! I want to know how Lena does on the outside, what happens to Alex, and if there are any new characters, etc. I've actually already read it and thought it was amazing! I would love to own it! I am dying to know what happens to Alex! I hope he is okay! And I can't wait to see Lena become a strong fighter against the cure! Thanks so much for the giveaway!!!!! I am most looking forward to finding out what happened to Alex and I really hope he's still alive and that Lena will find a way to rescue him if he's still alive. This is one of the hottest titles coming out this year! I'm eager to see if it lives up to the hype! I am very excited to read this. Delirium was one of my favorite books of last year. I need to know if her mom is alive, and what happened to Alex! It's killing me! Well, I see everyone has said the big one. I'm most interested in seeing more of the wilds. Well I just got the first book and have heard such good things about it, I am expecting good things from the second as well. Hey just discovered your blog at The Saturday Situation after reading your Pandemonium review, well done btw:) I guess besides the obvious answer of wanting to see what has happened to Lena and Alex after Delirium ends, I am interested to learn more about The Wilds and the history of what happened before the war(s). Thanks for the generous giveaway! I so want to read this!!! Thanks for the giveaway!! I can't wait to find out about that nagging cliff-hanger. Talk about gut-wrenching. Thanks for the giveaway! I have seen a lot of good - positive reviews on many websites. This always make me want to read a book & move it up on my list. I want to see what happens to Lena and Alex, Delirium ended on a huge cliffhanger! Thanks for the giveaway! Alex and Lena!!!! What happened! :) Thanks for the opportunity! I really want to know what is going to happen...will they be back together? I haven't read the first book yet its on my TBR. I have read many great reviews on the two books and can't wait to read. I'm excited to find out what happens next after the cliffhanger! I neeeed to know if Alex is really dead!! Getting back into such a wonderful world. I'm looking forward to see if Alex is alive! The ending of Delirium killed me. I need to know what happens next! i want to know what happens next...it was a killer cliffhanger!! Well, I hate it when the love interest hits the bucket...so I am hoping that he has not. Thats what I am looking forward to. If he has, I will be very very sad. I want to know what happens! The ending killed me! I wanna know what happens to Alex! I need to know what happened to Alex!!! The cliffie killed me! Where is Alex? I have the newly covered DELIRIUM, but have heard that it has a cliff hanger....so if I get this then I can read both back to back! Yeah seriously, wanting to know if Alex is dead or alive! Beat up, shmeat up. Who cares? It's an ARC anyway, not a finished copy. I just really badly want to know what's going to happen next! I need to know if Alex lived and if Lena finds her mom. I want to know what happens to Alex, and what Lena will do next. I want to find out what happens to Alex--Please don't let him be dead! Also does Lena find her mom? I'm dying to find out what happened to Alex, if he's alive or captured and hopefully that he escapes. I also want to know how Lena is now that she's on the run, and how/if she and Alex ever meet up again. The cliffhanger at the end of Delirium was brutal. I want to know how Alex and Lena find each other again, and I also want to know if Lena finds her mom! i want to know what is going to happen and im interested in seeing some twists to the story. Just ready to get back to what is happening with them. Couldn't put "Delirium" down, looking forward to reading book 2 "Pandemonium". Need to know what is going to happen. I am dying to see what happened to Alex!!!! I really want to see how Lena survives out there and meet new characters. 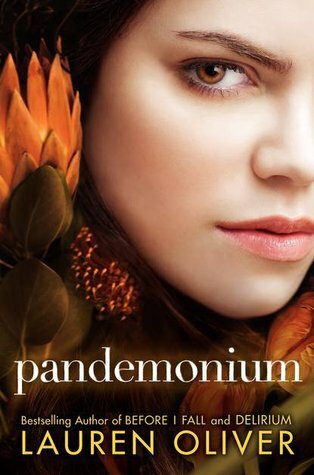 I have to read Delirium first, but then I'm totally excited to read Pandemonium! Thanks for the chance! I need to know what happened to Alex. I can't wait to find out about Alex! It looks like a great story! I haven't read any of her books yet, but I've been hearing so much about her that I would love to read one of her books. I just can't wait to see where these characters are going next. Finding out what happens next! I still haven't read Delirium (it's next on my TBR pile, I swear!) but I have heard so many good things about it I know I am going to love it and want to devour Pandemonium immediately. Delirium still sitting in my TBR pile, but hopefully I'll get to it soon. Thanks! I am looking forward to finding out what happened to Alex after that heartbreaking end! I am looking forward to finding out what happens next.